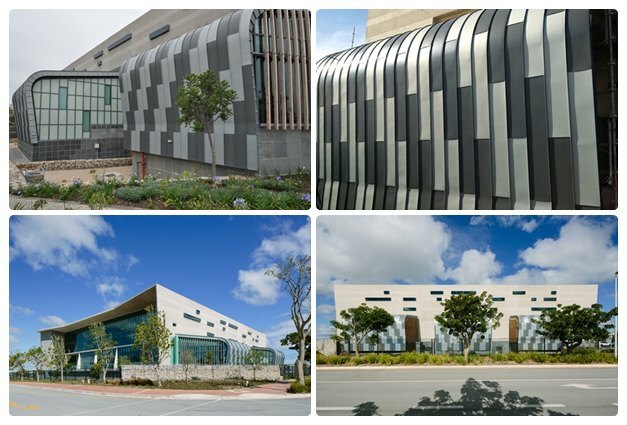 Rheinzink systems offer architects the freedom for implementing dramatic designs as illustrated in the design treatment of the Sanral building in Port Elizabeth. Rheinzink zinc alloy was specified for cladding three areas on the western facade, where weather prevails, since it uses little energy in production and is 100% recyclable. The Rheinzink cladding in two shades, pre-patina blue grey and pre-patina graphite grey, has been curved to give the building a softer shape.